Photo taken at Nehalem Falls campground. 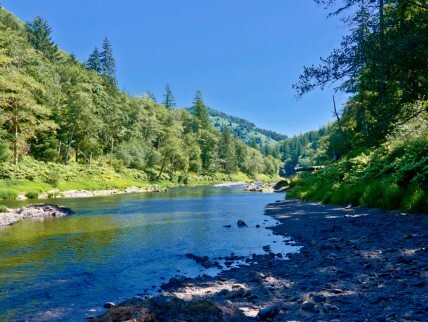 The Nehalem River is one of the top northwest Oregon salmon and steelhead fishing destinations. Chinook salmon begin showing up in Nehalem Bay in July, then run the river through December, peaking in September and October. The mainstem of the Nehalem river as well as north fork, are among the remaining Oregon river systems with a coho salmon season. These fish are available for catch-and-keep angling, hatchery-fish only, which are returning to the hatchery on the North Fork Nehalem. Only the lower river, between Fishery Point, in Nehalem Bay, to the confluence of the North Fork Nehalem, is open to fishing for fin-clipped coho. Steelhead are present here as well from late November through March, with the peak of the hatchery run being in the month of January till mid-February. Wild steelhead numbers peak in February and March but. Chinook salmon here average about 20 pounds while coho typically weighs about half that. An average Nehalem River steelhead runs around 7 pounds. The North Fork of the Nehalem River offers angling for coho and Chinook salmon as well as steelhead. Both species of salmon are moving through this fork in earnest by September and October. Chinook peak here in September while coho peak in October. Although Chinook are still in the river into December and continue to be available for anglers, fishing closes for coho in November. Only fin-clipped coho salmon may be kept. Winter steelhead are here from late November through March. The run of hatchery fish peaks between mid-January and February, while the wild run is most numerous in the river during February and March. Significant fishing pressure in the lower and hot spots on the North Fork. Eye protection recommended! Nehalem River Water Levels are provided by the United States Geological Survey data system.